NASA's Aqua satellite obtained a visible image of Hurricane Norman northeast of the Hawaiian Islands and found the storm weakening and battling wind shear. 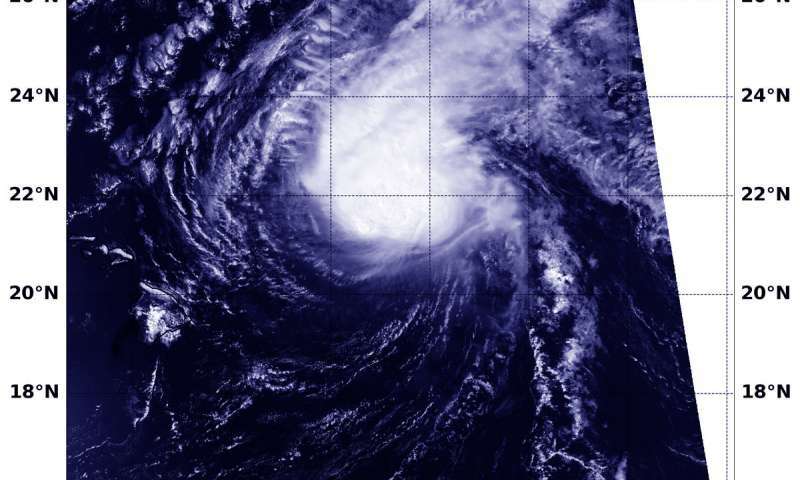 NASA's Aqua satellite provided an infrared look at Norman as it continued weakening and moving northwest of the Hawaiian Islands. It is not close enough to the islands to generate any watches or warnings, however, a large swell generated by Norman peaked across the main Hawaiian Islands overnight on Sept. 6, causing large and potentially dangerous surf along east facing shores. The surf is forecast to diminish on Friday, Sept. 7. At 5 a.m. EDT on Sept. 7 (11 p.m. HST on Sept. 6) the center of Hurricane Norman was located near latitude 22.5 North, longitude 151.7 degrees west. That's 290 miles (470 km) northeast of Hilo, Hawaii.